Plastic bags are ubiquitous the world over, but in Isatou Ceesay’s village in Gambia they are causing serious problems. Goats eat them, then become ill when they can’t digest them. Water collects in the piles of discarded bags, giving mosquitoes pools for breeding. Isatou comes up with a plan to recycle the bags by crocheting them into purses. Not only is the village clean again, but the purses provide income for the villagers. Isatou Ceesay is an inspiring role model, and Miranda Paul has done an excellent job making her story accessible to young readers. One Plastic Bag clearly explains the problems caused by discarded plastic bags. Not only will children everywhere be motivated to recycle bags, they’ll be inspired to think outside the box when searching for solutions to problems. Elizabeth Zunon’s collage illustrations, which include pieces of plastic bags, complement the text perfectly. An Author’s Note includes how Paul came to write One Plastic Bag, as well as a map, timeline, pronunciation guide, and a list of books for further reading. 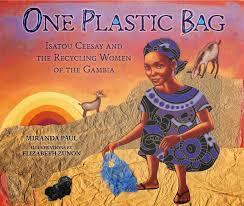 One Plastic Bag has its own website where you can meet Isatou Ceesay, Miranda Paul, Elizabeth Zunon, and others. You can also learn more at Julie Danielson’s lovely blog, Seven Impossible Things Before Breakfast, which featured an extensive selection of Elizabeth Zunon’s artwork for One Plastic Bag back in November. Jude Isabella and Simone Shin’s “extraordinary story of one ordinary bicycle” is a perfect book to pair with One Plastic Bag. Young Leo has worked hard and saved his money to buy a bicycle. He rides “Big Red” everywhere and takes such good care of it that even after a few years, it “looks almost brand new.” The problem is that Leo has outgrown his beloved bike, and wants to make sure its new owner will love it as much as he has. The owner of the local bike shop tells Leo about an organization that is collecting bicycles to ship to villages in Africa. Leo gets Big Red ready for its trip across the ocean, shown on a map by a dotted red line. When Big Red arrives in Burkina Faso, Alisetta is excited to get such a beautiful bike. The whole village cheers her on as she joyously learns to ride her new bicycle. Big Red makes life easier for Alisetta and her family by helping them get their sorghum crop to market. After Big Red is damaged in an accident, it’s recycled again. Now an ambulance, Big Red gets health workers to remote villages and sick patients to clinics where they get the care they need. Readers will be inspired to help get bicycles to African villagers, and information about organizations that collect bicycles or money to transport them is included at the end of the book. Ideas for follow-up activities and facts about Burkina Faso are also included. Both of these books will be great additions to any K-5 unit on recycling and can be used to inspire opinion writing about the importance of recycling. They will provide children with a look at daily life in Western Africa, increase their awareness of the importance of recycling, and show them realistic ways they can get involved in these important efforts. 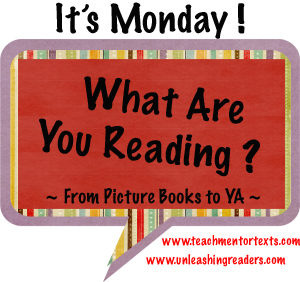 Don’t forget to visit Jen at Teach Mentor Texts and Kellee at Unleashing Readers to find out what other people have been reading lately. Thanks, Jen and Kellee, for hosting! Poetry Friday: What Does A Seashell Know? My school has donated money to efforts to get teachers in Africa bikes. When I ride to work, I am very glad that no one is shooting at me! These both look like good books. One Plastic Bag looks like a must-have for me. Thanks for reviewing it! I haven’t seen either one of these titles! Adding them to my TBR list. Thank you for highlighting them both. An expensive little post, Catherine. Both are going into my wishlist for our recycling units. Thanks! Both of these books look fabulous. I’ve added them to my shopping cart. I can imagine how kids will get out of them! One Plastic Bag sounds so great. There are always students who study re-cycling. 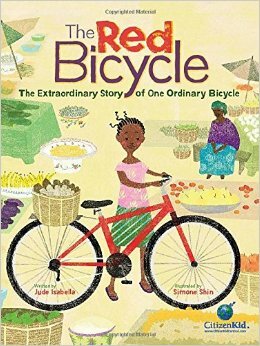 I just got The Red Bicycle from the library-will read it soon! Thank you for sharing, Catherine! Both of these are new to me, and I think they both will bring good messages to readers. These both sound excellent! Thanks for the reviews! I didn’t know about these two titles – they look like really good picturebooks with worthwhile messages.